If you are like most people in this world, the pile of paper coming into your home on a regular basis is nothing short of crazy. It seems that even in a society that tries to use less paper, we can’t get on top of it. In conjunction with my new ebook – launched at the start of this month (would love to know what you think!) I have put together my top 15 tips to get started, but of course, the ebook goes into loads of detail about ways to implement the ideas (64 pages worth!) – so read the post below, and if it whets your appetite to really get to grips once and for all with the paper in your home, click here to find out more! When storing important documents, they don’t need to be as easily accessible as your home file – so consider storing out of reach – this is also more secure. Scan each document you file into your computer so you have a backup should anything happen to the original – best to be prepared as it will be much easier to get back on track if you have an emergency in your home such as flood or fire if you can send your documents to the insurance company etc… still. Only keep items for the time that they are needed – there is no point in keeping last years car insurance paperwork when this years has arrived, just get rid of them and you will keep on top of the paperwork. For self employed people, 7 years is the key time frame to keep items. 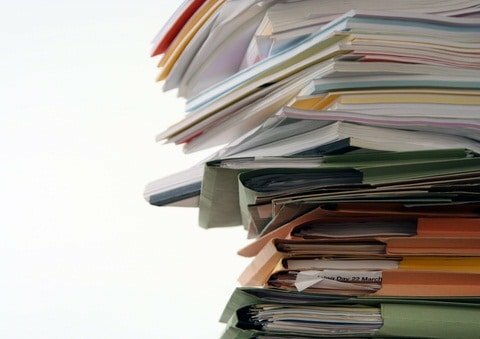 When setting up a filing system, ensure that each section is clearly defined – and DO NOT have a MISC or OTHER section as you will never find anything once filed – make each section specific – its better to have lots of easily found sections than a messy vague filing system where you still can’t find anything. When reading magazines, fold down the corner of any pages that have interesting articles or things you need to keep – when you have finished reading the magazine rip out all the pages that you want, and get rid of the rest. You could then make a folder up of all the snippets you have cut out, which is great to pick up when you want something to read, as you know that you want to read everything in it! Keep only current issues of magazines and newspapers etc…, unless you really need to keep them for work or a hobby – ask yourself will you honestly ever have time to read them again? Give them to friends / family / doctors surgeries / hospitals etc… or recycle. Ask yourself if you need to buy magazines or newspapers at all – can you get the information you need online? Immediately open all mail and get rid of the junk mail and any unneeded items straight away – have a bin by where you open the post to make this as easy as possible. Have a place to put each member of the households post each day so that they know where to look and nothing should get lost. Try to deal with paperwork in batches – so all outgoing mail is sent at the same time so that it saves you rushing to catch the post, all filing is done once a week, all shredding is done in one go etc…. Don’t let things build up – deal with it daily, and definately don’t let the piles blend together or get bigger than the space they are allocated – you want to only touch paperwork once if possible. Cancel any catalogue subscriptions you have with stores you haven’t bought from for a while – also consider cancelling them all if you have internet access as you will be able to find all the most up to date information there. Previous Post: « Decluttering guilt – 5 reasons to let it go! Great tips and very timely as I had set myself a goal of filing my huge pile of personal and business paperwork by the end of the month. I especially like #s 1,3 and 5. Thanks! Hi Sarah – Glad you like the tips! Hope that your paperwork is now all sorted for you! If not, take a look at the new ebook I have written, as its got all the systems you need to keep under control from now on!